It was a sold-out Echo Arena in Liverpool, UK, that saw the return of former Super Lightweight Champion Amir Khan to the ring after an almost two-year hiatus from the sport. For Khan (31-4, 19 KO’s) there were two main questions to be answered. First, how much did the time off diminish his hand-speed and timing? Second, what effect (if any) did the scary Alvarez knock out have on the Bolton, UK, native? Unfortunately, the bout didn’t really last long enough to get definitive answers to those questions. In the first round, Lo Greco came out fighting behind an awkward high, pawing jab. Almost immediately, Khan blasted an overhand right straight past Lo Greco’s defense, and the Canadian went down hard. Lo Greco got back to his feet, smiling as though he couldn’t believe he could be so careless. But Khan pounced — exhibiting his hand speed of old — and Lo Greco had no answers for Khan’s sudden onslaught. That was it, Khan wins by TKO in the first round. In the post-fight interview, Khan acknowledged the supportive fans: “I was a little nervous, coming back to a full Liverpool crowd, but guess what: I’m back! 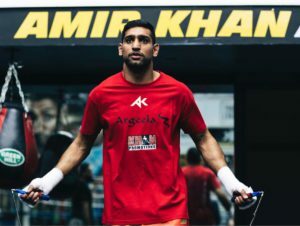 Khan is back!” He went on to promise that he would continue to fight in the UK, “I want to be a world champion again, to bring a big name back to England and fight him here.” Khan also insisted that his future was in the welterweight division, not at 154 lbs. The broadcast team tried to goad Khan into calling out former IBF Welterweight Champion Kell Brook, who was ring-side as a SKY Sports commentator, but Khan repeated his intention to fight next at 147. When Brook entered the ring, the boxers went on a fairly conventional (and artificial) verbal sparring match that lasted longer than the actual main event. In the featured undercard bout, Tommy “Boom Boom” Coyle (24-4, 11 KOs) took on Commonwealth Lightweight Champion Sean “Masher” Dodd (15-3-1, 3 KOs). It was a competitive and entertaining bout from the opening bell, with both fighters taking risks and throwing offensive punches. Coyle caught Dodd with an overhand right with ten seconds left in the fourth round, but Dodd managed to survive till the bell. In the sixth, Coyle landed a perfect right counter, dropping Dodd awkwardly to the matt, and the former champion banged his gloves in rueful frustration before rising to his feet. This time, however, Coyle piled on, leaving Dodd’s corner no choice but to throw in the towel. It was a treat for US boxing fans to be able to stream a SKY Sports broadcast, via the new ESPN+ service. The next ESPN+ boxing live stream on June 9th features WBO Welterweight Champion Jeff Horn taking on American superstar Terrence “Bud” Crawford, as the Omaha fighter moves up to 147 lbs. 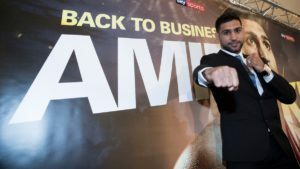 This Saturday, at the Echo Arena in Liverpool, UK, former unified super lightweight champion Amir Khan (31-4, 19 KOs) returns to the ring after an almost two-year hiatus from the sport. His opponent is Phil Lo Greco (28-3, 15 KOs) of Toronto, Canada. The bout will stream exclusively in the US at 5:30 ET as part of the Top Rank on ESPN series. Khan, 32, is a Bolton, Lancashire native, but Saturday marks his first appearance in the UK in almost five years. A star since his break-out year in 2009 when he won his first world title, Khan has racked up wins over Marco Antonio Barrera, Paulie Malignaggi, Marcos Maidana, and Zan Judah. In 2011, Khan suffered a tough, split-decision loss to Lamont Peterson, followed seven months later by a TKO loss to Danny Garcia. None daunted, Khan returned to the ring in December of 2012 and rang off a series of five wins over the likes of Carlos Molina, Luis Collazo, Devon Alexander, and Chris Algieri. This string of impressive victories set up a WBC world welterweight title fight against Saul “Canelo” Alvarez. Giving away a serious weight advantage (made all the more frightening by Canelo’s recent clenbuterol controversy), Khan took one-too-many left jabs to the body. When Alvarez feinted another left jab and Khan dropped his hands, Alvarez delivered a crushing straight right to Khan’s chin, dropping the British fighter and silencing the T-Mobile Arena crowd. Phil Lo Greco has fought almost all of his professional career at super welterweight, though he generally weighs in around 150 lbs. Fighting almost exclusively in Canada and Europe early in his career, Lo Greco has two big-name fights on his resumé. In 2013, he dropped a twelve-round unanimous decision to Shawn Porter on wide cards, and in 2015 he lost to rising star Errol Spence, Jr., by third-round TKO. Since then, Lo Greco has gone 2-1 against second-tier opposition. For Khan, he must put the ghost of the Alvarez knockout behind him. It would be easy to walk away from the sport after such a scary loss, but Khan is a warrior – just check out the Maidana fight. While Khan’s ring movement and hand speed can be dazzling one wonders how much his skills have rusted during the almost two-year break. Finally, there are the intangibles, like hunger, focus, and mental preparation, all of which are crucial for success at the top level of the sport. Khan can be an impulsive and emotional fighter, letting his will to tangle get himself in trouble. “I am one of those fighters with a huge heart, I like to get into tear-ups,” Khan told ESPN, “and I like to mix it up.” Coming home to the UK, will Khan want to put on a show for his home fans? Most definitely, but he will have to minimize his risk-taking if he wants to keep Lo Greco from landing a fortuitous power-shot. Streaming live at 5:30 ET on Saturday evening, fans can stream ESPN+ on the ESPN app on mobile and TV-connected devices, or on ESPN.com. ESPN+ is a new, direct to consumer streaming service from the Walt Disney Company, in partnership with ESPN.